in a 5-minute contact time on hard surfaces . Furthermore, it is sporicidal at concentrations of 3000 ppm. Organic matter can reduce the bactericidal effect of peracetic acid, and the concentration of Peracetic acid required to kill bacterial spores need to be increased by 2 to 3 times. Overall, as a disinfectant, Peracetic Acid is one of the favorable choices available to be used in almost any sector. How does peracetic acid disinfection work ? Peracetic acid is NOT systemic bactericides. The mode of action is by oxidation. 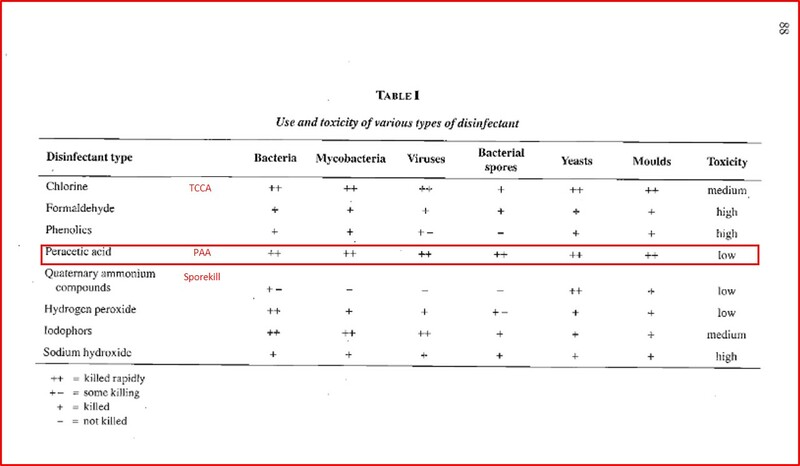 Peracetic acid as a disinfectant oxidizes the outer cell membranes of microorganisms. The oxidation mechanism consists of electron transfer. When a stronger oxidant is used, the electrons are transferred to the microorganism much faster, causing the microorganism to be deactivated rapidly. The bactericidal effect increases with temperature. Between 10°C and 30°C, in every difference of 10°C, the sterilization effect differs by 1.2 to 5 times. At a temperature of 15 °C and a pH value of 7, five times more peracetic acid is required to affectively deactivate pathogens than at a pH value of 7 and a temperature of 35 °C. Optionally, Peracetic acid can be SEPERATELY integrated with powerful infection-fighting qualities of ionic SILVER Nano particles. Silver majorly has few roles … Activator and Oligo dynamic action. This combination yields synergistic effect several orders of magnitude more powerful compared to the effect of either agent. 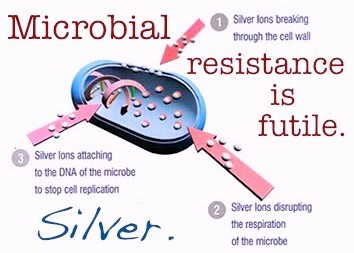 Silver ions are active against a broad range of gram-positive and gram-negative bacteria. Nevertheless, silver resistant strains of microbes are evolving. It is therefore interesting combining silver compounds with a peroxide of a combination of peroxides to prevent resistant formation. The main advantage for using silver compounds is the persistent antimicrobial activity over a wide pH range. To clean slime and algae from drip system tapes and emitters, meter this product 60~120ml/1000 liters of water. When required, during normal irrigation cycles, use this product at the recommended dose for a minimum of 30minutes. After an irrigation cycle do not flush the lines. This product can be used to suppress/control algae and slime formations in and around greenhouses. For normal use in various process, irrigation or sprinkler watering systems, this product may be used at 24~195ml/1000liters. Heavily fouled systems, such as evaporative coolers or irrigation/drip lines, may need shock doses of up to 600ml/1000liters. NOTE: This product at its use dilution is compatible with stainless steel and aluminum surfaces. If product is intended to be used on any other surface, it is recommended that you apply product to a small test area to determine compatibility before proceeding with its use. Use this product as a direct soil treatment, as a pre-plant application, at seeding or transplanting, and as a periodic soil treatment throughout the plant’s life up to the day of harvest. The performance of this product is not affected by fumigation. Use this product on fumigated and unfumigated soil. completely. Mix 1300~3000ml/1000 liters of water . Make banded or broad cast applications of 100 to 400 liters of solution per acre-row either prior to planting or at the time of planting. This product will not harm seedlings or plants when applied at labeled rates. In fields with a history of disease pressure, use the 400 liters of mixed solution per acre-row rate. Wait one day before inoculating the soil with beneficial microbes if required. Apply this product at any stage of plant growth as a soil treatment up to the day of harvest. Make applications using soil drench, flood or drip irrigation. Ensure that soil moisture of the beds is at or near field capacity prior to application. Apply 300ml/1000 liters of water per 1,000 square feet of soil to be treated . Use 300ml/1000 liters of water. Apply first treatment during the first drip irrigation cycle. Apply two additional treatments at 7-14 day intervals. Under severe disease conditions, apply at 7-day intervals using the highest rate. Under severe disease conditions and during periods of rainy weather, apply this product immediately following rain to suppress the spread of disease and help oxygenate the soil. Combine lower rates of this product with other non-metal based fungicides. Use this product as a fungicide/bactericide to treat/control plant diseases on all flowering plants, ornamentals, house plants, vegetable, berry and fruit plants, trees and shrubs. Not all plant diseases have been tested, but some of the common diseases controlled /suppressed are .. Apply this product to ornamentals, bedding plants, vegetable plants, flowering plants, shrubs, and trees. To ensure that this contact fungicide is effective, thorough coverage and wetting of the foliage is necessary. Care should be taken when using this product for curative control of obligate organisms living on the plant tissue (such as downy and powdery mildew). These treatments may result in lesions on plant tissue. This product will oxidize parasitic organisms living in plant tissue that are not always visible to the naked eye. Resulting oxidative effects may include spotting, or drying of the plant tissue where organisms inhabited tissue. 1. Use 600~1200ml/1000 liters of water. Do not reuse already mixed solution, make fresh daily. 2. Spray, mist or fog plants in early morning or late evening. 3. Thoroughly wet all surfaces of plant, upper and lower foliage, including stems, branches and stalks to ensure full contact with the plant and flower tissue. 4. Apply consecutive applications until control is achieved and then follow directions for preventative treatment. 1. Use 400ml/1000 liters of water . Do not reuse already mixed solution, make fresh daily. 2. Spray, mist or fog plants. 3. Thoroughly wet all surfaces of plant, upper and lower foliage, including stems, branches and stalks to ensure full contact withthe plant and flower tissue. 4. Spray every five to seven days as a preventative treatment. At the first sign of disease spray daily with 600~1200ml/1000 liters of water for 3 consecutive days and then resume weekly preventative treatment. Manufacturer’s recommendation 4ml/liter is the maximum dosage. A widely known alkaline composition such as potassium hydroxide can be used as a pH-adjusting agent for adjusting the pH of the peracetic acid, ideally treatment solution in range pH 7~8 is recommended in agriculture application. A nonionic spreader (surfactant @ 0.01%) adjuvant may be added in foliar application since conidia are hydrophobic (water repelling). P-San is clear, colorless liquid (pungent vinegar-like odor). Peracetic acid containers should be made of non-metallic materials as much as possible. During the storage process, a large amount of gas can be generated due to decomposition. Therefore, they can only be packed in dark-color polyethylene plastic barrels (bottles). Fill up the capacity up to 80% of the container. All kinds of packaging containers should have vents made of functional materials that are breathable but do not leak liquid. Avoid exposure of sunlight or heat during storage or transportation. Due to its nature is unstable, it can release oxygen at room temperature, spontaneous combustion, burning or explosion in the event of open flame or high temperature. For verticillium and fusarium : Use concentration yields a minimum of 500 ppm of active peracetic acid with high biocidal activity. This concentration is sufficient to control most common diseases. Spray this concentration in direction from bottom of plants to above. Repeat this step, three times with a 3 to 7 days interval between the applications. For heavily infected roots and related diseases : use concentration provides 500 ppm of active peracetic acid. Apply it with the last 15 minutes of irrigation. Try to treat the infected roots of plants with this concentration. Repeat this irrigation step, two times with a 3 to 7 days interval between the applications. Bacteria : PAA will inactivate gram-positive and gram-negative bacteria, fungi, and yeasts in <5 minutes at <100 ppm. In the presence of organic matter, 200-500 ppm is required.